Daniel Brown ('18) and Marcella Meza ('18) hold signs created by PRIDE for the event. 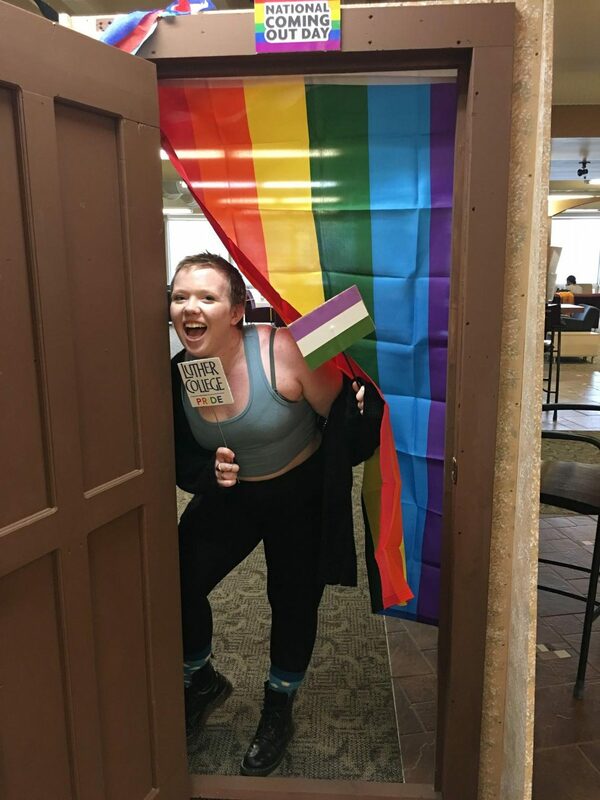 Students held rainbow signs and flags while members of Luther College People for the Rights and Inclusion of Diversity and Expression snapped photos in front of a doorway to show their support for the LGBTQIA+ community in Dahl Centennial Union. On Wednesday, Oct. 10, PRIDE hosted this event to celebrate National Coming Out Day. The annual LGBTQIA+ awareness day actually falls on Oct. 11, the anniversary of the 1987 National March on Washington for Lesbian and Gay Rights. However, the event took place a day early at Luther because of how it coincided with Fall Break. PRIDE Secretary Wyatt Anians (‘19) said the day was to celebrate all identities and show people that they will be accepted after coming out. Anians wants students to learn that coming out is a life-changing lifelong process. Maya Tuff (’21) poses in front of the mock doorway in the Union. 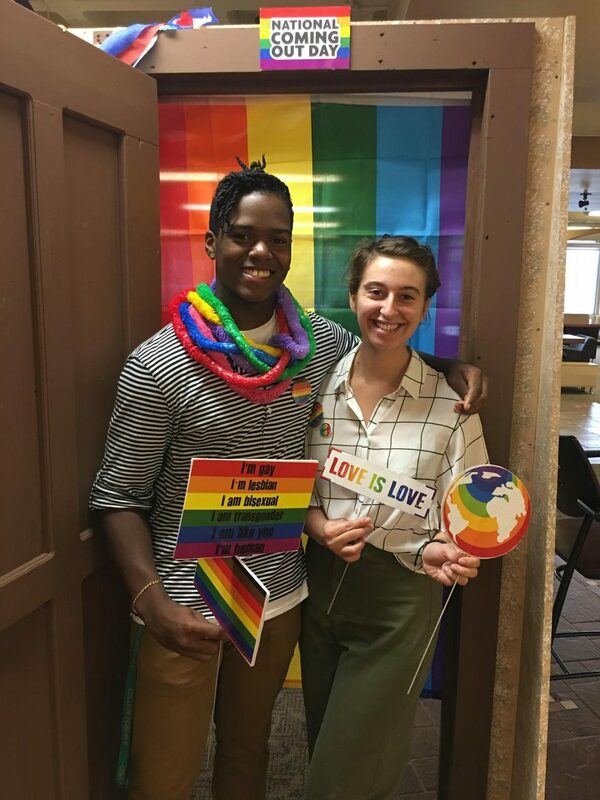 President of PRIDE Filiberto Lopez-Garcia (‘19) wanted this day to serve as a reminder to students and the community that coming out should be a celebration. LGBT History Month involves multiple events throughout October with the purpose of celebrating diversity in the community. Lopez-Garcia wants to see these events become more popular. “This is a time to come together to remember those who have made an impact on our community and to remember the fighters who died to allow us to be proud of who we are, openly and unashamed,” Lopez-Garcia said. PRIDE Vice President Matthew Espey (‘19) enjoyed planning and setting up the event. This involved wheeling the rehearsal door donated by the Visual and Performing Arts department from the acting studio in the CFA to the Union and decorating it with streamers and cut-outs that members of PRIDE helped to create. The setup involved a variety of identity flags and signs for students to take pictures with. Espey was pleased with the turnout and said that during the hour in which he manned the table for the event, he took photos for 20 different students. He hopes future Coming Out Day events will bring more people who identify as allies to take photos.